Valentine’s Day dinner at the Laughing Water Restaurant by Crazy Horse Monument, is one of the most romantic date venues in South Dakota. A dinner date at the restaurant can be reserved for the 14th and 15th, February, 2014 between 5pm and 8pm. 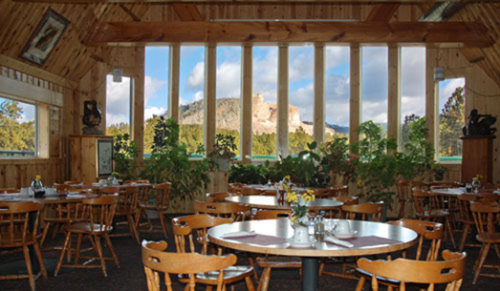 South Dakota - - February 13, 2014 /MarketersMedia/ — Making this Valentine’s Day extra special, Crazy Horse Monument has introduced a special dinner deal at their Laughing Water Restaurant. Located in the Black Hills of South Dakota, the restaurant is known for its exceptional view of the Crazy Horse Mountain. “On the 14th and 15th of February, we have opened the restaurant for Valentine’s Day dinner, from 5 pm to 8 pm each evening. The admission is free with 3 cans of food per person owing to the KOTA Care and Food Drive”, explains Ant Lankee of Antkee Research. Laughing Water Restaurant is known to serve appetizing meals and claims Tatanka Stew and the Native American Taco as their specialty. “The restaurant has designed a special menu for Valentines. Prime rib, Cornish game hen, salmon, halibut, and sirloin steak are some of them. All deserts and sides are included in the meals”, recounted Ant. Crazy Horse Memorial Foundation is a non-profit organization that operates the memorial. This memorial is an epitome of attraction in South Dakota. “The setting for the Valentine dinner, amidst the splendid view of the mountain is a unique experience,” continued Ant. The museum and restaurant are occasionally decorated, keeping in view festivals and seasonal holidays. “There is likely to be a rush for Valentine dinner dates, so a table cannot be guaranteed unless a prior reservation is made”, concluded Ant Lankee. In the memorial complex, the restaurant is located between Hill City and Custer at Hwy 16/385. This valentine's day dinner deal introduced by Crazy Horse Monument is open for telephonic reservations for the February 14th. With the beautiful Crazy Horse Mountain at sight and a sumptuous meal on the table, this V-Day dinner is a not-to-miss experience. This romantic indulgence over a candle-light is sure to set the cupid flying in South Dakota on Valentine’s Day.